Notes: Bitbox delivers recording, clip launching, and looping in a musically intelligent way. With a 24-bit audio path, you can capture and play samples with impeccable audio quality. With clock and MIDI inputs, you can create loops pre-cut to bars or beats and launch clips with similar synchronization. Bitbox has a capacitive touch screen that makes easy work of tweaking, browsing, and loading sounds from microSD card. 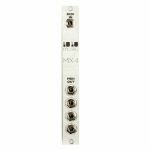 Notes: The MX4 Buffered MIDI Multiple by 1010music serves a very simple but useful purpose: it takes in a single MIDI input and repeats it in real time to four MIDI outputs. The end result is you can now control four times as many devices from a single MIDI source. The MX4 includes two MIDI adapters to connect with any equipment using the MIDI standard, 5-pin DIN connector, two TRS cables for MIDI patching and a standard power ribbon cable for connecting to your Eurorack. 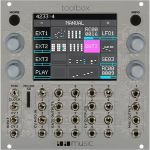 Notes: Synthbox is a 4 note polyphonic synthesizer for your Eurorack system. Connect your favourite MIDI controller to synthbox and start jamming with built in presets. Use the touchscreen to choose and shape the waveforms and to apply the built in sound effects. Modulate the waves and the effects using a combination of on screen controls of envelopes, low frequency oscillators, and sequencers together with hard wired CV inputs to tweak the sound to meet your creative vision. Because synthbox is a Series 1 module, you can swap out the synthbox firmware for other series 1 module firmware quickly and easily. This means you can switch to bitbox or fxbox firmware simply by signing up at forum.1010music.com, downloading the new firmware and following the instructions on the forum. You can also download the latest synthbox firmware to get new features and updates. It's like getting three modules in 1 with available upgrades! Notes: Toolbox is a musically intelligent control module capable of driving a rack full of gear. 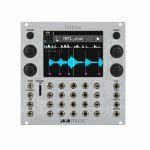 It features both MIDI and Control Voltage connections for interfacing with all kinds of different hardware. Toolbox takes full advantage of the integrated 3.5" touch screen to give immediate access to sequences, parameters, and events. The screen provides a full overview of all the active notes and events. It even offers touch based scrolling and zooming, just like a smart phone, to make editing easy and fun. Toolbox is a great way to be creative on your terms. Notes: ADSR is a four stage linear envelope with two expressive ranges. Each stage can be modified independently allowing for the creation of complex, multi-segment envelopes. Great for modulating filters, VCAs, and oscillators. Notes: Arp is a gate-driven arpeggiator with a multitude of chord types and playback modes. Voltage control over both root note and chord type allow for sequencing any combination of chords in any key imaginable. With the rate of the arpeggio and reset capability in your own hands, you're free to create dynamic rhythmic melodies from your favourite chords. Take your tonality for a ride with Arp. Notes: AVert is a dual attenuverter. Each channel offers the ability to attenuate and invert any input signal. The signal present at channel one is normalled to channel 2, allowing for two unique output signals from a single input. Get Inverted. Notes: Brst is a voltage controlled burst generator and trigger delay. Upon receipt of a gate signal, Brst will output a stream of triggers. Knobs and CV inputs give the user control over speed and the number of repetitions. 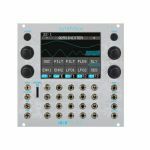 Whether you're generating bouncing balls, crafting IDM drum beats, or humanizing a clock signal, Brst will prove an indispensable addition to your rack. Notes: The 2hp Buff is a buffered multiple capable of splitting an input signal to multiple outputs. Due to its active architecture, inputs retain their full integrity as they are copied to multiple destinations. One input signal can be copied to six outputs, or two inputs can be copied to three outputs each. The Buff is especially great for splitting pitch or audio signals where signal integrity is critical. Keep your signals in shape with Buff. Notes: Clk is a voltage controlled clock generator with all the features a master clock needs. It has an extremely wide range from ten seconds between pulses well into audio rate. In addition, the pause button and CV input provide an expressive feature that is all too often missing in a modular setup. Stop using LFOs or other modulation sources for your master clock, and let Clk do what it's best at. Notes: Comb is an IIR peaking comb filter with control over cutoff frequency, resonance that can be driven into self oscillation, and a dampening filter in the feedback path. An incredibly short, tuned delay line will alter the character of your input by imposing harmonic peaks on the source. Subtle settings can result in thickening timbres, reminiscent of phaser-like effects, while more extreme settings can create lustrous string sounds from white noise, or tear your waveform to shreds. Explore new sonic territory with Comb. Notes: The 2hp DC is a voltage offset generator. It creates three channels of offset voltages, each with a different output range. Great for manually controlling CV inputs through a known range or summing together with CV signals to act as a bias. With the addition of a multiple, you can control several modules at once with a single knob. Take control with DC. Notes: Delay is a flexible, full-featured delay audio processor. CV over all parameters provides dynamic access to its nuanced controls. The feedback path ranges from slapback to infinity, allowing for wild permutations of the original signal. Notes: Div is a 2 channel, voltage controlled clock divider and multiplier. Incoming clock signals can be multiplied or divided by a factor of 16 with a multitude of values in between. Notes: EG is a full featured two-stage envelope generator. In addition to a colossal range from 3ms to 11 minutes per stage, EG features the ability to switch between linear and exponential curves on the fly, a built-in attenuator, and CV over attack and decay. Boasting more features than modules five times its size, EG can fill any envelope-sized gap in your system. Notes: Envelope generator with linear and exponential shapes. CV over decay time and end of attack gate output. Notes: Euclid is a rhythmic pattern generator based on ideas originally presented by Euclid, the Greek mathematician. The Euclidean algorithm can be adapted to create rhythms by taking the total number of active steps in a sequence, and then distributing them across the entirety of the pattern. Notes: Freez is a voltage controlled locked looper. It captures moments of audio in buffers, where they can be minced and mangled beyond recognition. Once frozen, adjusting size will cause pitch and timbre changes to the locked audio. Notes: Hat is a hi-hat cymbal with a wild side. Finding something unique is easy with a blend of sounds ranging from robotic to metallic. At its core are three unique sound sources made up of six oscillators, a noise generator, and a number of filters. Sizzle affects each source independently, adjusting oscillator and filter frequencies, allowing for a broad range of sounds. In addition, separate trigger inputs for open and closed allow for a complete hi-hat pattern on a single module. No matter what situation it's in, Hat provides shimmering, metallic timbres for any percussive purpose. Notes: Kick is a bass drum synthesizer with a dramatic timbral range. Its flexible synthesis engine ranges from 808 to IDM with its punchy kicks and smooth distorted tones. 1V/Octave tracking across five octaves allows for tonal sequencing of the entire frequency range. Drop a beat with Kick. Notes: LFO is a voltage controlled low frequency oscillator. 8 waveforms are available with smooth morphing between each, allowing for complex and unique patterns. Notes: LPF is a four-pole, voltage controlled low-pass filter. Its 24 dB per octave slope and OTA topology provide a smooth, buttery character. Resonance can be pushed to self oscillation, turning it into a sine wave VCO with accurate 1V/oct tracking across four octaves. Notes: MIDI is a plug and play solution for interfacing with your computer or MIDI hardware. Four modes provide monophonic, duophonic, dual mono, and quad trigger operation. Notes: Mix is a 4 channel mixer that is great for audio or control voltage signals. Up to four inputs can be combined to a single output each with its own level control. Notes: MMF is an analogue, multimode filter with a 12dB per octave slope. Its sonic character swings all the way from classic low pass to squelchy acid lines. Simultaneous outputs of low pass, high pass, and band pass filter types are provided allowing for many variations of the input signal. Whether you're looking for smooth and creamy, or resonant and wild, MMF can go there. MMF is an analogue, multimode filter with a 12dB per octave slope. Its sonic character swings all the way from classic low pass to squelchy acid lines. Simultaneous outputs of low pass, high pass, and band pass filter types are provided allowing for many variations of the input signal. Whether you're looking for smooth and creamy, or resonant and wild, MMF can go there. Notes: Mult is a 2 input, 6 output signal splitter. Channel 1 is normalled to channel 2 when no cable is present, allowing the user to split an input signal six ways, or two input signals with three outputs each. Notes: Nse is a white noise generator. The sample rate of the noise can be adjusted allowing for a wide range of sounds all the way from white noise to aliased, low frequency rumble. In addition to its normal operation, VCA mode is accessible where enveloped noise bursts are emitted upon receiving a trigger signal. This facilitates the quick and easy creation of hi hat, snare, and percussion sounds. Whether you're looking for a traditional noise source, or a quick way to generate drum sounds, Nse offers a powerful, high quality solution. Notes: Play is a high-fidelity sample player with a full feature set. Up to 32 samples can be loaded at a time and dynamically switched between using the file knob and associated CV input. Playback modes include one-shot, looping, or gated playback; all with extremely low latency. Transform your samples by pitching them up two octaves or down three octaves, all with a pitch knob that can be free running or quantized to semitones. The pitch CV input tracks volt per octave across its entire range and allows for musical sequencing of samples. Play ships with a pre-loaded SD card packed with loops, drum hits, and field recordings to get you up and running immediately.